With gaming notebooks proliferating and the PC gaming industry undergoing a bit of a renaissance, it may be difficult to fathom the need for a LAN-style small enclosure. 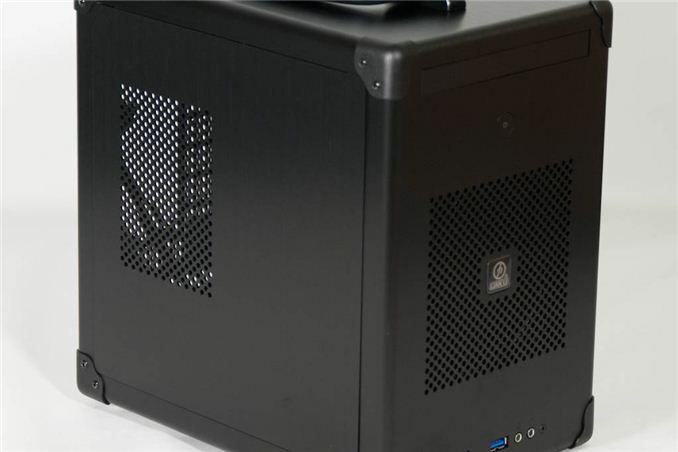 Yet these cases and builds using them are proving popular, with the mini-ITX form factor picking up steam due to continued improved integration in motherboard chipsets. Despite the odd nomenclature, the Lian Li PC-TU100 is a descendant of their previous PC-TU200, a LAN-oriented enclosure we reviewed a year and a half ago. Common to both boxes are the rounded corners, the handles, and the pop-out side panels. 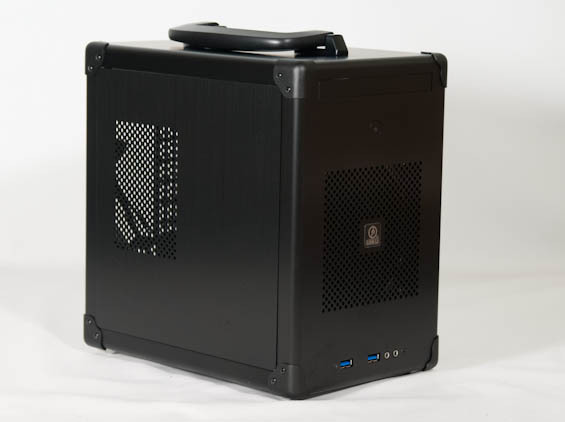 Yet the PC-TU100 demonstrates much more evolution and is a far more forward-thinking case. Miniaturization is becoming increasingly common; 3.5" drives just aren't as important as they used to be, and slimline optical drives have cratered in price to the point where they can be found for roughly the same amount as their full height siblings. Small form factor power supplies are getting more and more robust, too. The PC-TU100 takes all of these things into account in its design, and it's refreshing to see something this smart come through. Dimensions 9.84" x 6.7" x 10.24"
You can see that in their effort to get those dimensions down, Lian Li cut the PC-TU100 pretty much down to the bone. Storage options are reduced to a pair of 2.5" drive trays and a single slimline optical drive tray, and space is saved on the power supply by opting for supporting the SFX form factor instead of the much larger ATX form factor. Note, though, that CPU cooler and GPU clearance are also low; you're not going to be able to build a super powerful system in this case, so your component choices should be planned accordingly. I've been following that NCase for a while now. I love its design and compactness. Assuming that Dustin will review it, I will guess that he will not like it too. The designer Necere himself did several temperature & noice benchmarks. And they are high. In fact, he doesn't even recommend watercooling the GPU with the H220 due to the fans have a lack of airflow. It is recommended to use a video card with a blower style cooler. If you are watercooling, only use the 120mm radiator kits. The case needs the other fan slot. So you'd be better off with a nice air cooler from Noctua, etc. Based on that, Dustin will have the same complaint here. And most likely another complaint because it's so small and tight. So, basically, too big for a compact mITX case, but too small for anything you'd want to put in a larger mITX case. Or, more succinctly, mediocre. Especially with the likes of APU and Haswell and their improved graphics that don't require the extra space.